As a San Francisco Wedding Photographer, I perform wedding photography all the time. There’s something about getting the perfect shot that only the best photographers truly understand. If you want to find the right San Francisco Wedding Photographer, it would help to ask to see some of the previous works a prospective photographer has done. This gives you the chance to judge just how good the photographer really is. But even then, how do you know what really goes into an exceptional wedding photo? Most good images will nail it on 2 or 3 of the above elements, but fall short on the others. Every once in a while you come across a photo that scores an A+ across the board. Such photos are the really great ones; the ones that almost literally take your breath away. I’ll have to admit at this point: I don’t nail all of them in all my photos either. I can easily score 3 or 4 out of 6, but getting all 6 takes a lot of effort and time. On the flip side, striving toward it as a goal makes me grow better and better every day as a San Francisco Wedding Photographer. These 5 elements act as a yard stick and also as tools for the photographer to create high quality photos. As a client, it helps if you understand how they work so you can judge your wedding photographer using the same standards they would expect to be judged with by other professionals in the field. If you find a photographer who captures all 6 elements in a single photo, you can be sure you’ve struck gold. Color is perhaps the most important element when it comes to setting the mood of the photo. It has the uncanny ability to touch the viewer deeply on an emotional level. With the right mix of color, you could make a photo feel exciting, depressing, melancholy, or even mysterious. Being able to stir the emotions of the viewer is crucial to creating a powerful photo and color is the most important tool that helps us achieve this. When you look at a wedding photo, it’s not just about the smiles on the faces of the bride and groom; how well the color of their clothes and accessories blends with the color in background matters too. Be sure to take note of the photographer’s use of color when you look at their portfolio. Light is the all-important element. Without adequate lighting, you don’t have a photograph. All you have is a dark and apparently blank canvas. Here the quality of light, as well as its direction, matters a great deal. With good use of lighting, a good photographer can emphasize certain elements in the frame or even create a deep sense of depth through the marvelous interplay of light and shadow. When combined with a good use of color, good lighting helps to enhance the mood of the photo. A good wedding photographer will want to take photos of the wedding couple in the best possible lighting. Whether they’re looking for the perfect shot in natural lighting or want to go the extra mile by creating the perfect shot with the use of artificial lighting, you’ll be able to tell when they’ve been thoughtful about the whole process. The moment is all about how the parts of the photo come together to tell a story. The story should be captivating and make the viewer go wow. In a wedding photo it could be anything. It could be the look of anticipation on the groom’s face as he waits for the bride to walk down the aisle. It could be the way the bride and groom hold each other at the reception. It could be the eager smiles of the women at the party as they wait for the bride to throw the bouquet for them to catch. Every photograph should tell a story and excite the viewer’s imagination. Look out for this as well when going through a photographer’s portfolio. Composition is all about arranging the objects in the frame in such a way as to emphasize certain things about them. Think of how a couple might want a photograph taken with the groom’s men and bride’s maids on either side of the two. The bride’s maids might be on the bride’s side, with the tallest at the farthest end and they can all line up. Ditto for the groom’s side. This helps to emphasize symmetry and, coupled with a few good background elements, such their reflection in a pond, might tell allude to the symmetry of the love that both the bride and groom bring to the union. The distance chosen by the photographer will have an effect on the impact the photo has and also how many elements can be squeezed into the photo. It all depends on what the photographer chooses to make the focus of the photo. If it’s the faces of the bride and groom, then the distance will be slightly shorter, and vice versa. 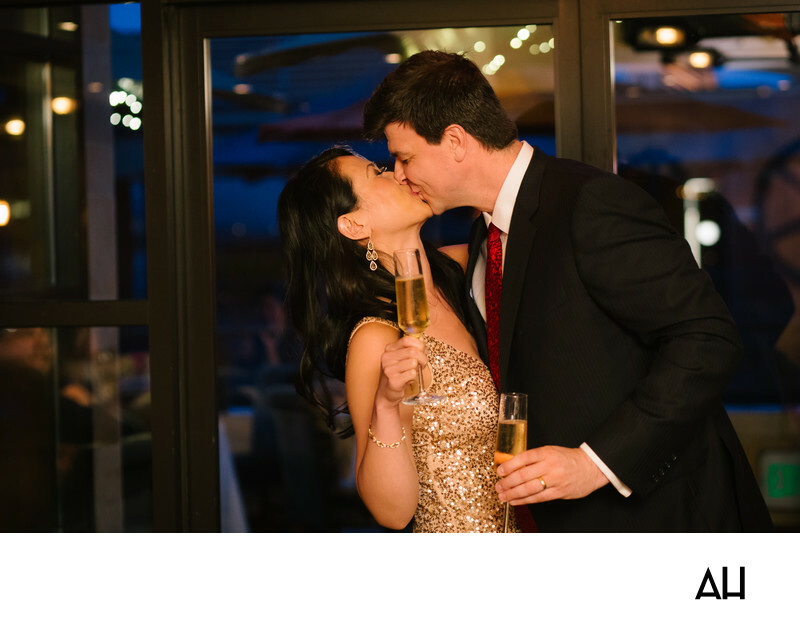 The venue for this photograph is set on the San Francisco Bay and guests who attend are able to witness the breathtaking view of the Bay Bridge through the Epic Roasthouse expansive windows. In this image, the bride and Groom stand in the outdoor patio area of the venue. Through the windows, one can see guests seated at tables chatting with friends and looking out at the newlyweds. Lights inside the room bounce off the windows and create a lovely backdrop for the bride and groom. Outside, the couple shares an affectionate kiss under a starlit night sky, with the scenery of the San Francisco Bay and the Bay Bridge before them. The bride in this photograph chose to wear a non-traditional wedding dress. Her gown is covered in gold sequins that shine and shimmer in the moonlight, a unique and beautiful choice. The bride’s hair is down and curled, with golden drops hanging from her ears and a gold bracelet adorning her wrist. The couple is framed by the clear glass doorway that leads out the patio, making them the center of attention and of the image. The groom is striking in a black suit, white dress shirt, and red tie. He cannot contain his expression of joy as he kisses his wife, dipping her back slightly in his arms. The bride and groom both hold a glass of champagne, which they will each raise in a moment to toast to a lifetime of love and happiness.